When creating a business process in Laserfiche Forms, you can use templates to speed the process. These templates come with a preconfigured process model and starting form, and are ideal for simple form submission or approval processes as they eliminate the need to diagram the process in the Process Modeler. For information gathering processes where only a form is needed, using the Form submission process allows you to focus on the form creation aspect of the business process. 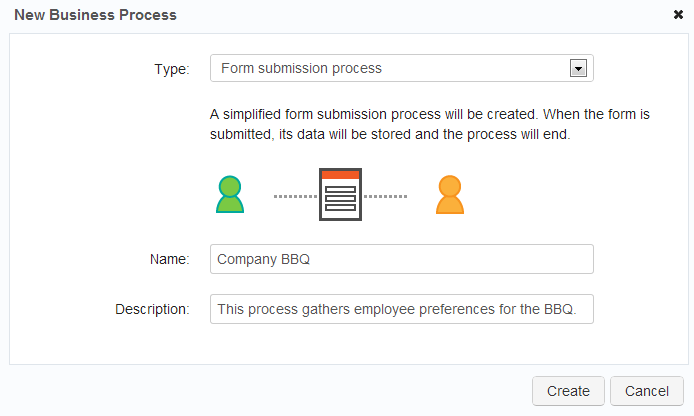 If you select this type, Forms will create a starting form for you, and configure the process model so that the process ends after that form is submitted. From the Manage page, click New Business Process. In the New Business Process dialog box, select the process template you want to use from the Type drop-down. Name the new business process and, optionally, assign a description. You can also create your templates from your existing processes. These templates include the original business process’ configured process model and forms. From the Manage page, select the business process you want to use as a template. Export the business process by clicking Export in the toolbar. The process will be exported as an XML file and it will be saved in your Downloads folder. Move the XML file into the following location on the Forms server: C:\Program Files (x86)\Laserfiche\Laserfiche Forms\Forms\Template. To use the template you’ve just created, follow the steps outlined in the “To use a business process template” section above. Learn more about creating Forms business processes by visiting the Laserfiche Forms online help files.